Modern times are allowing us to examine mummies in a different way—through x-ray analysis, CAT scanning, and DNA testing. The times of opening a mummy physically have faded in the past and now much of the work is done through advancements in technology. New technological advancements are allowing us to peel back the layers digitally, thus, giving us a view of the preservation process without destroying any evidence. The benefits are astounding. Medical information can be determined in a matter of minutes, exposing the mummy fully only takes seconds, and digital records can be saved for further examinations. Though considered slightly outdated, x-ray technology is still used in examining mummies. The benefits are great and it is another alternative to CT scanning. This technology was not permitted until 1967 and it took a group of visionary scholars from the University of Michigan and Alexandria to push this technology. Eventually, the campaign was led by Dr. James E. Harris. Their investigation was a breakthrough in adapting modern technology and studying ancient royal mummies. The outcome was so successful that other royal mummies were x-rayed as well. In 1968, King Tut (Tutankhamun) got an examination too. The x-ray revealed a bone fragment inside the base of his skull. This tiny fragment has been the cause of so much controversy and caused a great deal of speculation as to how he died. Because of this fragment, many have argued King Tut was murdered, while others believe the damage was caused after death. Though we’ll probably never now how he died, x-ray technology has allowed us to examine all mummies in depth and intact. Another promising technology is CAT scanning. This technology allows scientist to study the bodies without disturbing its contents and allows scientists to see things exactly as they were 2000 years ago. By taking pictures of the mummies in layers, soft tissue such as the organs can now be seen untouched and unaltered. Several digital images are combined together recreating the body in 3D. This allows clear viewing of what’s beneath the wrappings and shows everything as it was thousands of years ago. Although X-rays and CAT scans prove to be a positive tool in researching these ancient packages, so does small amounts of tissue samples. Small samples of tissue removed from the body are hydrated, which is still a difficult procedure, and are analyzed for further information. Other samples removed around the body such as linen, dust particles, and plaster can be carbon dated. This allows scientists to identify the time period the mummy came from. This accurate dating system allows scientists to compare current information and put identities and dates to the bodies. Bones and teeth remain an important factor of deciphering the life of a mummy. Through bones and teeth, an individual’s age and cause of death can be predicted. Younger mummies are determined more easily due to the growth in the bones and layers in the epiphyses, which are the joints. The layers help to identify the body’s age up until 25 when all the layers combine together. Bones also reveal the quality of life, certain diseases and injuries throughout the mummy’s life. 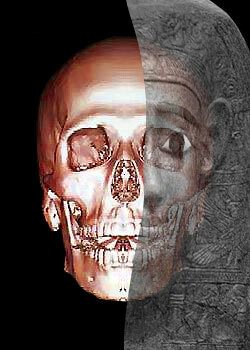 Another factor used in identifying and analyzing mummies are through their teeth. Their teeth can help determine the age and diet of the mummy. Deciduous teeth are found in small children, while young adults have teeth that are grinded down due to diet. If signs of wisdom teeth are present, the age is estimated to be in the early 20’s. Examination though teeth can be difficult and must be based on a group of mummies that also lived in the same environment that can easily be compared to the others.